My Gr Gr Gr Grandparents, Martin and Catherine (Dolan) Kelly, had the nerve to die before 1906. Beyond obituaries in San Francisco newspapers, I haven’t been able to locate a will or death certificate because they don’t exist. But, this document might change things. I spent sometime going through the San Mateo County Index to Deeds at familysearch.org tonight. Around 1890, I began seeing entries for a Martin Kelly. There wasn’t anything to say it was my Martin Kelly, and one was definitely not mine (wrong middle initial). The last entry has Kelly, Mathew (Grantor), then Martin Kelly (Grantee). I found a few entries like this with the names reversed, too. Mathew Kelly was the name of Martin and Catherine’s son. I am fairly sure these are my people because there were only a couple Martin Kelly’s living in this area at the time–and only one, mine, had a son name Mathew. In 1890, the address changes slightly to “Ws Mission Road near 6 Mile House”. He wasn’t living at the 6 Mile House, but near it. There is family legend that he owned more than one “mile house”. His daughter, Mary (Kelly) Meincke) and her husband owned the 5 Mile House. I believe the family stories lead to Martin owning the 7 and 8 Mile Houses. In 1891, the address changes completely to County Road/Nagle. In one record it is noted as County Line. There is also another reference of him living near Ocean View. This leads me to believe that Martin Kelly owned property outside of the County of San Francisco and inside the County of San Mateo. These entries in the San Mateo County index make me wonder if one of these pieces of property could be the 7 or 8 Mile House. There’s more! Martin Kelly died 25 Sep 1899. In 1901, I found several entries labeled “Kelly, Martin, Estate of”. Could this be my Martin Kelly? If so, then it begs another question. Was Martin Kelly’s death recorded in San Francisco County or San Mateo County? It may make a big difference to my research! The San Francisco records are lost. There was a reconstructed probate file, but I did not find Martin’s name in it. 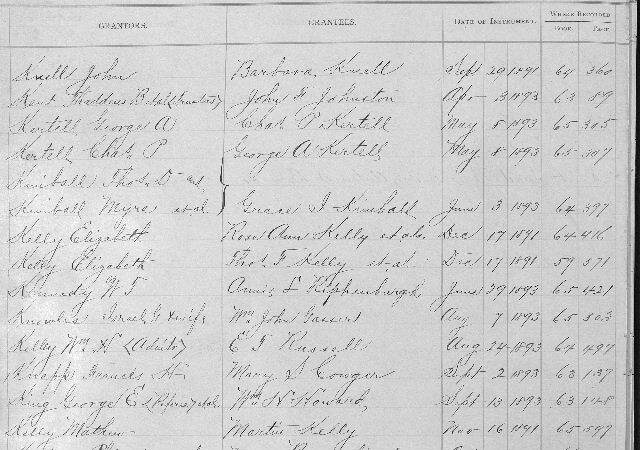 If his death was recorded in San Mateo County, there may still be hope that records survived the 1906 earthquake and fire–a death record, probate file, land transfers? It is certainly worth pursuing! Maybe this is the bit of genealogy luck that I need. I know Martin Kelly owned multiple boardinghouse/saloons. It is not unreasonable to think that he might have owned them in San Francisco and in the outlying areas. I’ve never worked with property records, so this is a whole new area for me. Time will certainly tell!